UPDATE: This version comes with some new visible changes, improvements and bug fixes. We have shared various skin packs in the past months. If you wish to create your own skin pack, you will have to change DLL’s, EXE’s etc. It is a cumbersome process. 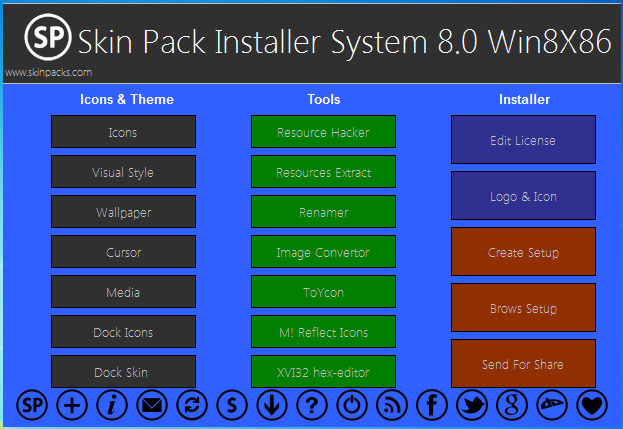 But here is a free tool “Skin Pack Installer System” which makes this process easier. This free and portable tool will let you create your own skin pack. After seeing above picture, you might thought that it is difficult to use. But here we are instructing you how to use it. First of all, click one of the button to replace the corresponding file. Then It will show you resources. You can, if have, replace these resource (files) with the resource files you have. For example, you have created your own batmeter.dll file and wants to replace it in your skin pack. Then just click the batmeter.dll button in DLL Files section and replace the source. If you still have a problem, just post it in comments. We recommend you to uninstall old version of this tool if you already have installed. If you like this article and want more updates, you can join us on Facebook and Twitter also. How To Shutdown Windows 8 Without Mouse? How To Use Switch Statement In Android/Java? How to run particular code only once at every Android App Start? How To Run Dave Like Old DOS Games On Windows 7, 8 and 8.1? How To Make A VB.NET Application Always Run In Administrator Mode? We redirect users to our social network pages when specific icon is pressed. We aren't responsible for any data used by such 3rd party websites. Apart from this, we use comments form which take general information like Name and show it to other visitors.